Join us at IRC: irc://irc.efnet.org/srrdb or use our chat widget! The srrDB release lister plugin! We have created an amazing plugin for all of you movie fans out there! 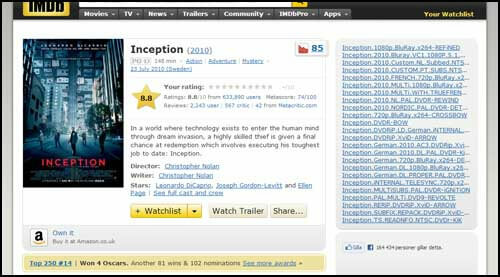 The plugin will give you a list of releases for a specific movie, tv-series or something else, when browsing imdb.com. The plugin works in most browsers including Chrome, Firefox, Opera and Safari. Download the release lister plugin. You must login to see the poll.